Roast halved Brussels sprouts, quartered small onions, and halved carrots at 375° for 30 minutes. Toss with just-cooked pasta, a splash of balsamic vinegar and crumbled feta cheese. 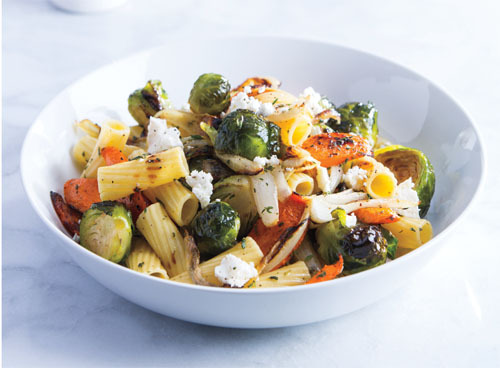 Simmer 10 whole Brussels sprouts for 5 minutes, then coarsely chop and mix with 3/4 cup Greek yogurt, 1/4 cup grated Parmesan cheese and 1 clove of minced garlic. Gently press into a greased 9-inch glass pie plate, sprinkle additional Parmesan on top, and bake at 350° for 35 minutes or until top is brown and bubbly.